Mar 6, 2014, Taipei, Taiwan –FZLED, maker of high-performance LED lighting products, is exhibiting at Taiwan International Lighting Show 2014 (TILS 2014), from March 20 through March 24 at TWTC Nangang Exhibition Hall. 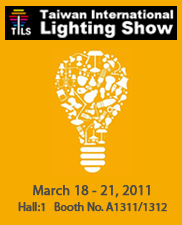 FZLED will introduce its latest products and energy-saving LED lighting solution in TILS. Global Buyers, media, and the general public are all welcome to visit FZLED’s booth (Booth #J0504). FZLED is going to introduce its latest products, including the LED tube, omnidirectional LED bulbs, and LED night light torch. The latest LED tube T8-05L uses SMD LED and offers 10, 18 and 20 watt in two feet (58 and 60cm) and four feet long (120cm). It is direct replacement for traditional T8 tubes and fits standard G13 sockets with an AC voltage range of 100-240V. The new collection omnidirectional LED bulb GU60-02 uses 12 watts SMD LED, fits standard E26, E27 sockets to conveniently replace traditional lighting source. It could be used in different applications such as indoor, office, storage or residential usages. The most highlighted product of FZLED is the portable night light torch FZL-5100 (Farola). Made with high quality aluminum alloy, the lightweight aluminum LED torch incorporates night light, providing immediate and atmosphere lighting. It could be used in both home and work, including bedroom, living room and office. Torch and night light respectively consume 12 W and 0.5 W and feature CCTs of 6,500K and 3,000K. It comes with 5 segment control selections: all lights 100% on/off (torch and night light), torch 100%, torch 50%, flash (0.3 sec on/0.3 sec off), and night light on/off. FZLED will also showcase its LED downlight families in several size options (2, 3, 4, 6, 8, 10 inch), features ultra-thin, long lasting, and easy to install. It is designed to be the energy-saving replacement for traditional recessed halogen. Moreover, the popular torch series will also be exhibited in TILS Show including LED bike torch, hiking torch, diving torch, security torch, work light, head light and portable torch, in addition to several product line of LED bulbs, panel light, spotlights and tubes.